. EDGECORE 48 Port Managed L2+ Switch with 4x 10G Uplink Ports. EDGECORE 48 Port Managed L2+ Switch with 4x 10G Uplink Ports. ECS4120-52T is a high-performance Gigabit Ethernet switch featuring 52x ports, with 48x GE + 4x 10G SFP+ ports. ECS4120-52T is high-performance Layer 2+ managed switch with 176Gbps switching capacity. The Edgecore ECS4120 switch series is a Gigabit Ethernet access switch with four 10G uplink ports. The switch is ideal for Internet Service Providers (ISPs) and Multiple System Operators (MSOs) to provide home users with triple-play services with up to Gigabit bandwidth. 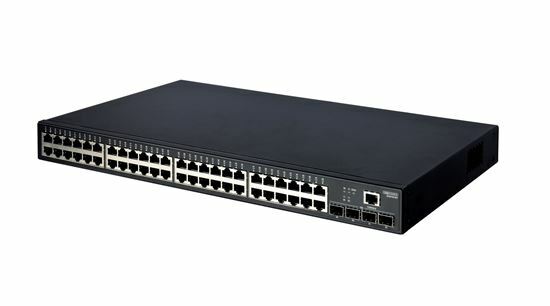 It is also an ideal Gigabit access switch for SMB, enterprise and campus networks. The ECS4120 switch series is packed with features that bring high availability, comprehensive security, robust multicast control and advance QoS to the network edge while maintaining simple management. The switch also supports the most advance IPv6 management, IPv6 security and IPv6 multicast control in accordance with the growth of IPv6 deployment. ISPs can expand their services from home to business users by providing a more reliable and resilient network (ITU-T G.8032 ERPS), L2 VPNs, and advanced OAM (Operations, Administration and Maintenance) functions to ensure service-level agreements. Comprehensive QoS - The ECS4120 Series offers advanced QoS for marking, classification, and scheduling to deliver best-in-class performance for data, voice and video traffic at wire speed. Superior Management - An industry-standard command-line interface (CLI) and supports SNMPv1, 2c, 3 and four-group RMON.